THIS MODERN GATSBY GOES TO COACHELLA WEDDING IS SERIOUSLY STUNNING! One of my favourite things about bespoke weddings are all the different ways couples can inject their own personalities. Nytasha and Joe held a completely DIY wedding with a “Gatsby goes to Coachella theme” complete with wall murals, Star Wars, cheesecake, glow sticks, and absolutely loads of color! “Nytasha and Joe know how to customize a wedding. This wedding was so uniquely them, and their honest love for each other was just the icing on the cake. Their vision for their wedding day was “Gatsby goes to Coachella”, and I think they nailed it! 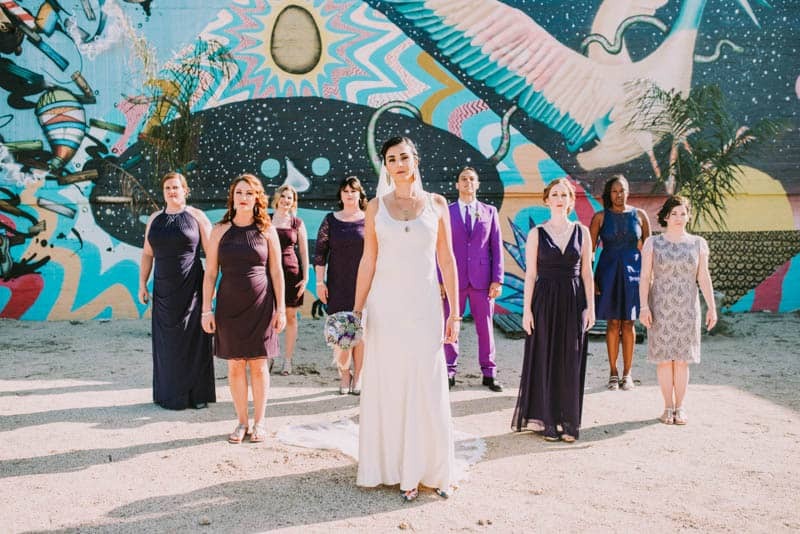 It was complete with glow sticks, graffiti walls, purple accents, and everything Star Wars.” photographer, Shelly told us. “While Nytasha was getting ready for the big day, she was calm and relaxed, and really excited! She always has a smile on her face, and it definitely matched Joe’s smile as he saw her for the first time as she walked down the aisle. He was able to hold it together right until the ceremony started, then we all watched him dry a tear or two! They wrote their own vows and both agreed to be there for the other 100%, while complimenting each other on being the best person they have ever known. It’s funny how two people can be completely unique in their own ways, yet compliment another person so well.” She added.